One of the biggest problems with any financial research is that patterns and strategies that worked in the past may not work in the future. The folks at the EDHEC Research Institute who created supposedly "new, improved" Risk-Efficient Indices about which I wrote a year ago, have now come out with data in the Live Results article that tests their theory. It uses actual results from the last two years, data that comes from the time after the new index method was worked out and thus could not merely be suited to the method simply because it was part of the data set used to create it. The "new, improved" indices are put up against the traditional cap-weighted index method which is taken as the benchmark or representation for all major markets like the S&P 500, the TSX 60 or Composite, the FTSE 100 and which underpins all the biggest ETFs around. EDHEC also compares results of other alternative indexing methods (which die-hard cap-weight believers refuse to call indices at all) like Equal-weighting, RAFI Fundamental and Minimum volatility. Here's one of the EDHEC charts for the US market. 1) The good ole cap-weight S&P 500 loses to every other method, not only in terms of raw return but also in various measures to adjust for risk (Sharpe ratio, Sortino ratio, Information ratio, Treynor ratio), just as it did in the model-building time period. 2) The FTSE EDHEC Risk-Efficient Index wins by the most and by a huge amount over the S&P 500. 3) Minimum Volatility is a close second, perhaps even first, given the risk adjustment ratios. Perhaps the new ETFs launched on this basis, which I wrote about in my other blog in Low Volatility ETFs - Promising Safety and Reward, are worthwhile. 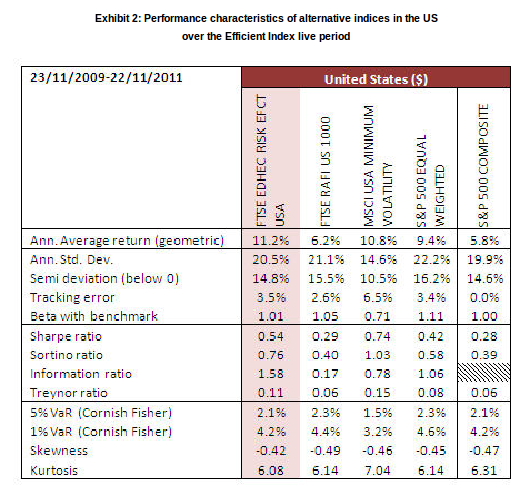 4) The Risk-Efficient out-performance is repeated separately in the UK, Eurobloc, Japan and Developed Asia ex Japan. RAFI fares indifferently (oh-oh, for my portfolio!). The other two couldn't be tested. 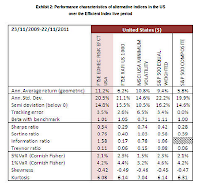 5) The Risk-Efficient performance is primarily NOT due to exposure to small cap and value factors. It comes from better stock weighting. 6) "... provide some evidence that the performance advantages of efficient indices largely stem from the improved diversification." So far, I've only been able to find one actual live fund that applies the new Risk Efficient index method, the Parworld Track FTSE EDHEC-Risk Efficient Eurobloc traded in Luxembourg. Expect more to come from the ETF industry. Is this a real improvement over cap-weighting, or an artifact of data that doesn't go far enough back (only to 1959 for the S&P 500)? Of course, by the time there is enough data to satisfy everyone, we will all be dead. That is so true. As an author and business man, I can relate to how you said "provide some evidence that the performance advantages of efficient indices largely stem from the improved diversification". I hope more people discover your blog because you really know what you're talking about. Can't wait to read more from you! Thanks for the kind words Daniel, hope your book sales are going well. after a long time i read any post on risk assessment or risk evaluation. and no doubt i found great material on it. thanks for the share!